Would you like to view and browse your entire collection, privately — or share with friends, family, or colleagues – on your own password-protected mobile-friendly website? For as little as $999/year ($99 monthly pricing available — see pricing details) with no setup or design fees, you can view, browse by artist, and search your collection from your computer, your mobile phone, your friend’s computer — from anywhere with an Internet connection. Quickly publish works and update your Collector Website in seconds from already-entered Pro software data and images — no additional data entry or image handling required. Bulk work import is also available from other’s art management software, excel, or manually via the powerful Content Management System (CMS). Website features include: view works by artist, view all works in image grid or list, keyword search, print work from PDF, full-window work view, active slideshow option, works carousel, work infosheet display, work email inquiry. 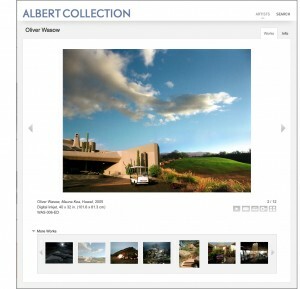 See our Collector Website sample site. Full-time live expert support is available Monday to Friday, 6 am to 6 pm NYC time. Pair with a ProFile mobile app for offline access to your collection, with additional private work details, additional features. Update both venues simultaneously. Each work can be displayed on just the website or just the app or on both. Please contact us and we’ll be happy to answer any questions and help you get started right away.